The planetarium's 180-degree screen spans more than 12,000 square feet: the footprint of a four-bedroom house. JERSEY CITY, N.J. —The Liberty Science Center in here has unveiled the largest and most advanced planetarium in the Western Hemisphere. Space.com had the opportunity to visit the Jennifer Chalsty Planetarium, a cinema masterpiece poised to bring astronomy to millions in the tri-state region. Liberty Science Center (LSC) has been showing films in its IMAX Dome Theater since 1993. But as technology advanced over the next decade and a half, the film cinema became outdated. In July 2017 after a generous donation from Jennifer Chalsty, a philanthropist and former educator, the science center began renovating the dome to turn it into a modern marvel. Space.com was invited to view the planetarium before its doors open to the public on Saturday (Dec. 9), and we were mesmerized. The wraparound screen immersed us in the wonders of the cosmos. Planetarium director Michael Shanahan took us soaring over the geysers of Saturn's moon Enceladus, past the rings of Saturn, and stopping for a visit with NASA's Curiosity rover as it explores Mars. The system's 88 million individual pixels re-created the New Jersey night sky (minus light pollution from Manhattan) in stunning detail. Shanahan pointed out Saturn, located right on the local skyline that evening. Then the theater transported us to the gas giant, settling in the planet's iconic rings. The enormous, wrap-around screen provided plenty of space for Shanahan to open up several real images of the rings — captured by NASA's Cassini spacecraft — without obscuring our view of Saturn. The planet had dipped below the horizon by time the theater returned to Earth 20 minutes later, as the system's clock continued to track the time while we were away. Shanahan also demonstrated the planetarium's color capabilities, bathing the theater in rich hues that saturated our field of view. The 10 digital projectors can display 281 trillion distinct hues. For comparison, the human eye can discriminate only around 10 million separate colors. So, imagine that for every subtlety in color you can see now, you could see 30 million finer distinctions. 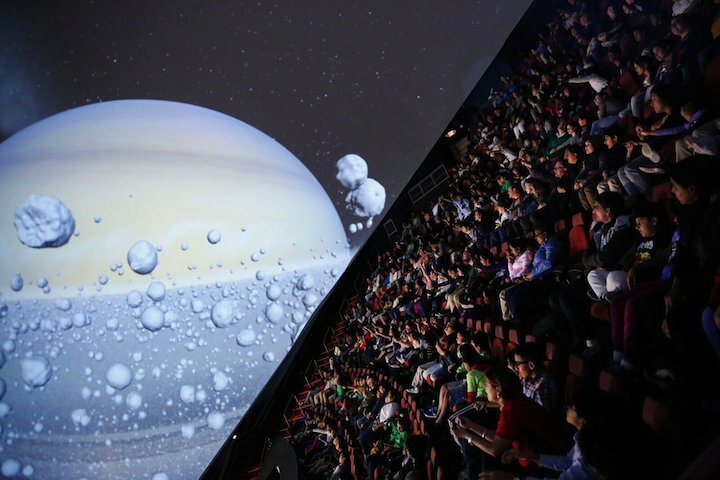 Interactivity will distinguish the planetarium shows from the IMAX movies that came before — and which the science center plans to continue. 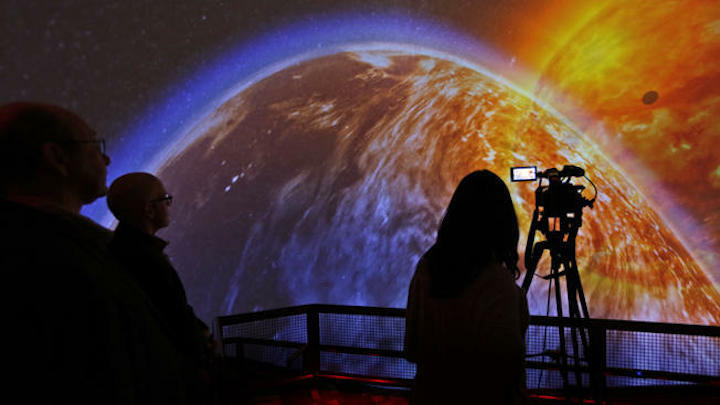 The software is wonderfully user-friendly, according to Paul Hoffman, the center's president and CEO, who told Space.com that they can lead planetarium shows from an iPad and field audience questions in real time. "If someone says, 'What were the best images before Cassini?' … [we] can fetch from the millions of images on our server room whatever the best images were," Hoffman said. "And that database is taking images on a daily and weekly basis from NASA, from the European Space Agency, from observatories around the world, so that it's totally up to date," he added. This archive is a boon to the science center, because in addition to its live, interactive shows, they plan to break astronomy and space news in the giant dome. "We're making relationships with space agencies around the world," Hoffman said. During its opening weekend, the planetarium will feature an exclusive fly-through of the Orion Nebula, created with images from the Hubble Space Telescope. The American Astronomical Society will officially release the visualization in January 2018. "We want to be a canvas in which space agencies can announce results, show their latest images, and be the place on the East Coast that is the hub nexus for all this breaking astronomy news," Hoffman said before we approached the majestic Orion nebula. Orchestral music accompanied our tour of the cosmic cloud, piped in from the state-of-the-art speakers located just behind the screen. The science center hopes to collaborate with artists and musicians to take advantage of the immersive dome and sound system. "Imagine shooting a 360-degree film and being able to show it here," Hoffman said. Our preview concluded with a ride on what they called the "space roller coaster": a trip along a giant twisted loop known as a Mobius strip, which a graphic designer had set upon a background of stars. After only a few seconds, we were clutching our armrests and looking for seatbelts. "I want to say the sky's the limit, but it's not even anymore," said Hoffman before we exited the dome.